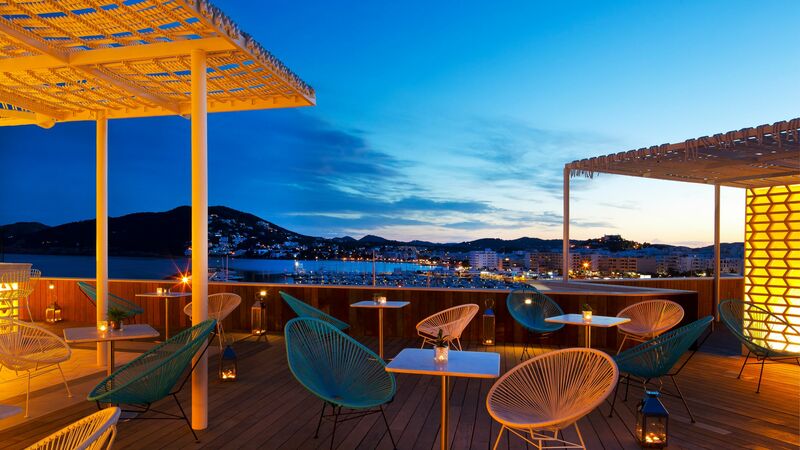 Located on the east coast of Ibiza in the peaceful resort of Santa Eulalia lies the Aguas de Ibiza Lifestyle & Spa, a member of the `Small Luxury Hotels of the World` this chic hotel has a relaxed atmosphere. The boutique-style property has been designed to bring together water, light and textures to create an environmentally friendly hotel which promotes sustainable living whilst ensuring that the comfort of their guests is never compromised. 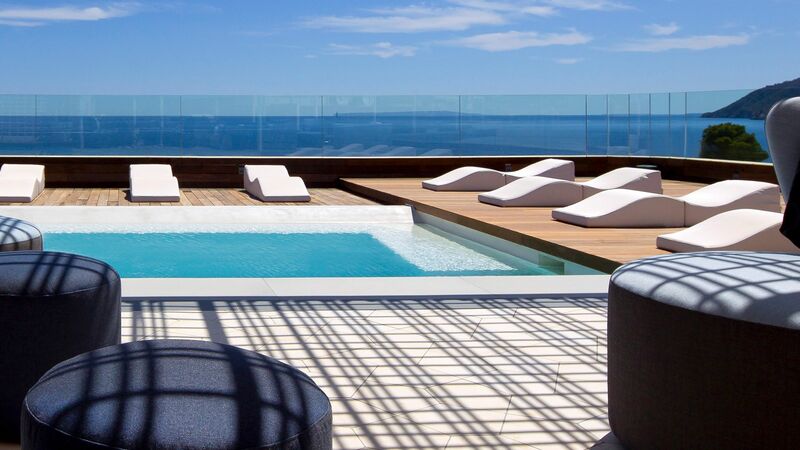 The hotel has three swimming pools, one of which is exclusively for adults and has a fabulous rooftop bar with scenic ocean views, the perfect spot to relax and enjoy the stunning scenery that Ibiza offers. Guests can also take advantage of the Revival Spa by Clarins which expands over 1500m² and features an indoor pool, sauna and steam room, or choose from one of the signature treatments which promises to leave you feeling relaxed and revitalised. 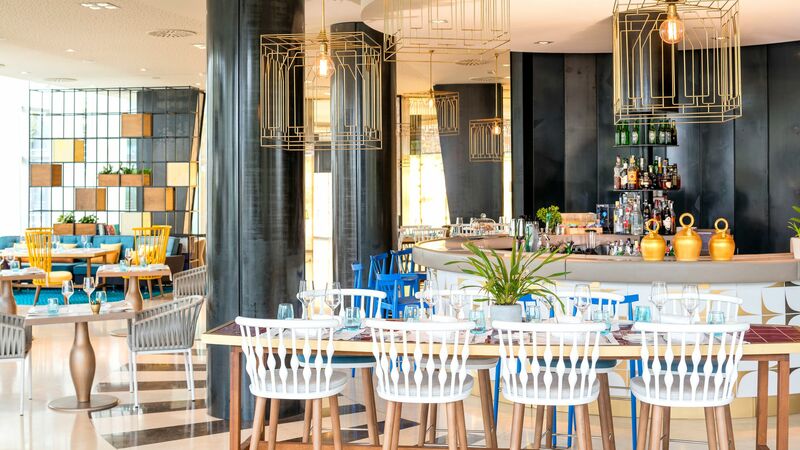 By night, the hotel offers guests a chance to enjoy a menu of traditional tapas created by two Michelin starred chef, Sergi Arola or head to the Alabastro Lounge, a more informal dining experience offering a fusion of Mediterranean and Italian cuisines. Child prices apply to ages 3-9 years. Located within the hotel lobby, the Alabastro Lounge has inside and outside dining areas offering a range of snacks and light meals during the day. 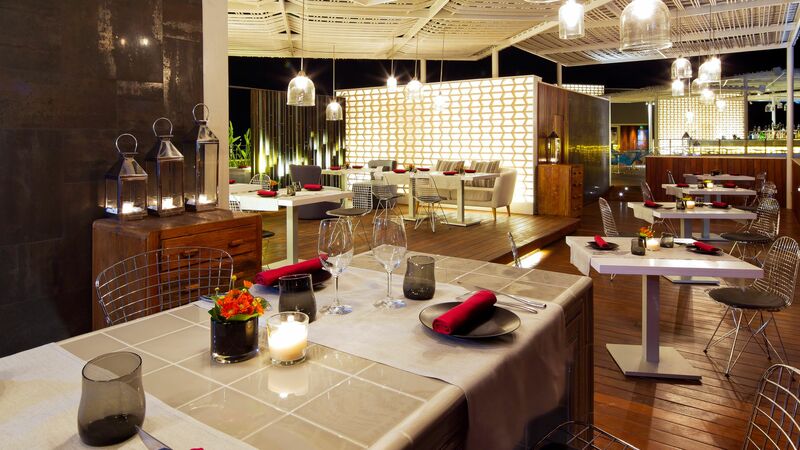 By night, Italian dishes with an Ibizan influence are served. Located on the ground floor of the hotel, Oligo serves a buffet breakfast with a range of items to suit all tastes including meats, pastries, fresh fruits, juices and Champagne. 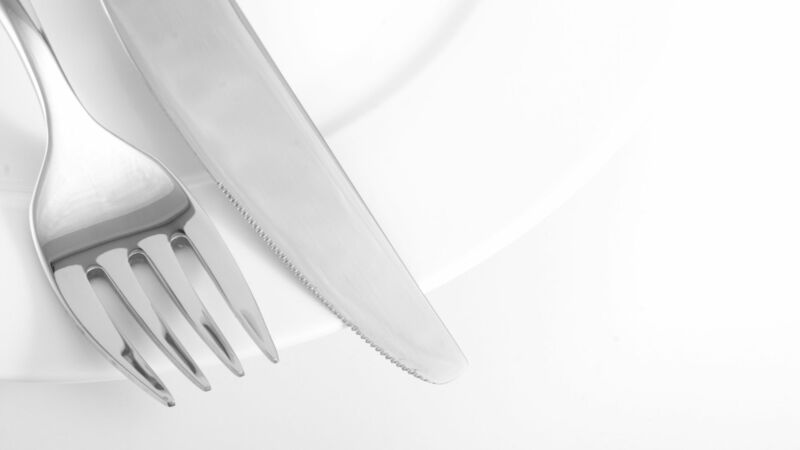 Award winning chef Sergi Arola blends traditional tapas with a modern twist at this contemporary setting. An extensive cocktail menu is served at the rooftop bar. The hotel has three outdoor swimming pools. Spanning more than 1500m², the spa at Aguas De Ibiza Lifestyle & Spa really is an oasis for peace and tranquility for guests who wish to indulge in a variety of massages and treatments. There's also a hair and nail salon as well as fully equipped gym on site with classes including yoga and pilates. Arty, charming and famous for its food, Santa Eulalia is a real gem on Ibiza's north-east coast. For years the resort has been a magnet for artists, resulting in a lovely mix of galleries, traditional crafts markets and waterfront portrait artists. Along the waterfront is a yacht-filled marina, two golden beaches and a tree-lined promenade. Calle San Vicente has earned the nickname Restaurant Street, and is the foodie heart of Ibiza. A few minutes inland from the beach, it's home to some of the top-rated dining spots on the island, where you can pick and choose anything from authentic Balearic eats to the likes of Indian, Italian, and Moroccan cuisine. The palm-strewn Calle San Jaime is lined with quaint pavement cafés – soak up the atmosphere with a morning coffee or an early evening cocktail. 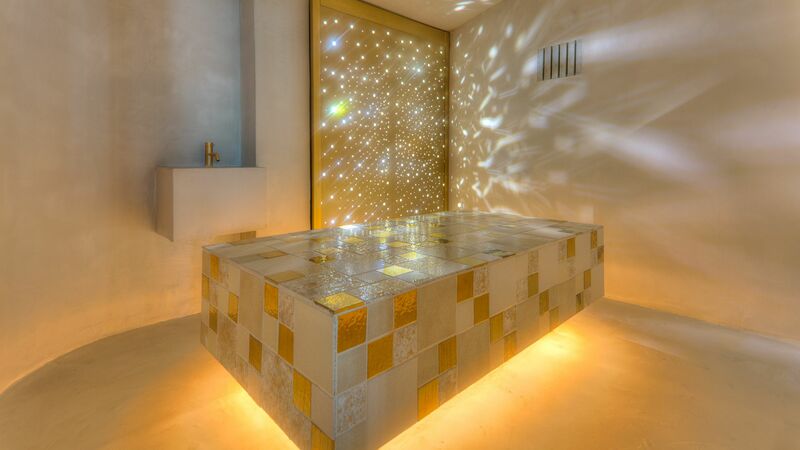 Dreamer Rooms are contemporary in design with natural stone bathrooms and feature a terrace area. Rooms have a double bed, pillow menu, coffee making facilities, Wi-Fi, air-conditioning and a Bang & Olufsen TV. Please note all room sizes include the terrace. Deluxe Rooms have a double bed, pillow menu, coffee making facilities, Wi-Fi, air-conditioning and a Bang & Olufsen TV. Junior Suites benefit from a living area, natural stone bathroom and terrace with garden or pool views. Rooms feature twin or king size beds, air-conditioning, pillow menu, coffee making facilities, Wi-Fi, bathtub and separate shower, air-conditioning and a Bang & Olufsen TV. These Junior Suites benefit from a living area, natural stone bathroom and sea views. Rooms feature twin or king size beds, air-conditioning, pillow menu, coffee making facilities, Wi-Fi, bathtub and separate shower, air-conditioning and a Bang & Olufsen TV. Corner Suites offer guests modern, spacious loft style accommodation. They have large windows which offer 180 degree views of the garden, pool or mountains. Grand Corner Suites measure boast magnificent panoramic views of the sea and bay of Santa Eulalia. The loft style suite has a canopy bed, living room and large bathroom with bathtub and shower cubicle. The spacious terrace has sunloungers, a dining area and a circular bathtub. Cloud 9 Suites offer guests luxurious and stylish accommodation with a double bed, bathtub with separate shower, panoramic sea views and an outdoor terrace area. Cloud 9 Corner Suites are the same as Cloud 9 Suites but are located in the corners of the hotel building. The Presidential Suite provides guests with a fabulous loft-style space featuring two bedrooms each with their own bathroom and a private terrace with bathtub. Save up to 10% on the hotel price for holidays between 23 April - 26 October 2019 booked at least 60 days prior to departure. Save up to 25% on the hotel price for holidays between 26 April - 18 July 2019 & 25 August - 26 October 2019 (minimum stay of 14 nights required). Honeymooners will receive a bottle of sparkling wine, chocolates and a romantic breakfast in the room the morning after arrival, a double or french bed plus a complimentary upgrade to a Superior Room subject to availability for holidays between 23 April - 26 October 2019. This is the second time we have stayed at this hotel. The staff is great, very welcoming, extremely helpful and accommodating. Excellent location, rooms very classy, I would not hesitate to recommend to friends and family and will certainly return in the future.. Magnificent views from the rooftop pool and bar! A friendly and helpful welcome at Hotel Aguas, the doorman remembered us from a year earlier which made us feel relaxed immediately. The staff were excellent in check-in and we enjoyed a nice glass if Cava while our bags were taken to our room. There is no heated pool available for children and the outside pools were took cold for us but other people were swimming, the Spa is excellent offering a very therapeutic experience absolutely not to be missed. The breakfast buffet is also wonderful. I was disappointed with the restaurant menu we were offered as the vegetarian option of grilled Mediterranean vegetables just doesn?? ?t seem like they?? ?re making any effort for alternative diets. Meat and fish all the way so I ended up with margarita pizza and fries from the children?? ?s menu. Not the evening welcome meal I was hoping for. Service was a little inattentive generally by waiting and bar staff it was the last week before closing to me it seemed a little like the mood was low and some staff were distracted by the end of season looming. Generally very good stay but I?? ?d expect a little bit more polished front of house catering staff in a 5 star hotel. Very friendly and helpful staff; Fantastic breakfasts; Lovely atmosphere in outdoor poolside restaurant for lunch. This hotel is very accessible for wheelchairs and it is a step-free & flat stroll along to Santa Eulalia town for the accessible beach and many level-access restaurants. Great views from third floor rooms across the harbour to Santa Eulalia town. No traffic as no through road. Fantastic spa with heated pools etc. Great cocktails with a view from rooftop bar.